Whether you’re a cat skiing virgin or are just looking for new places to check out, here’s all the beta you need to know. Cat skiing is backcountry skiing without having to hike or decide on terrain. 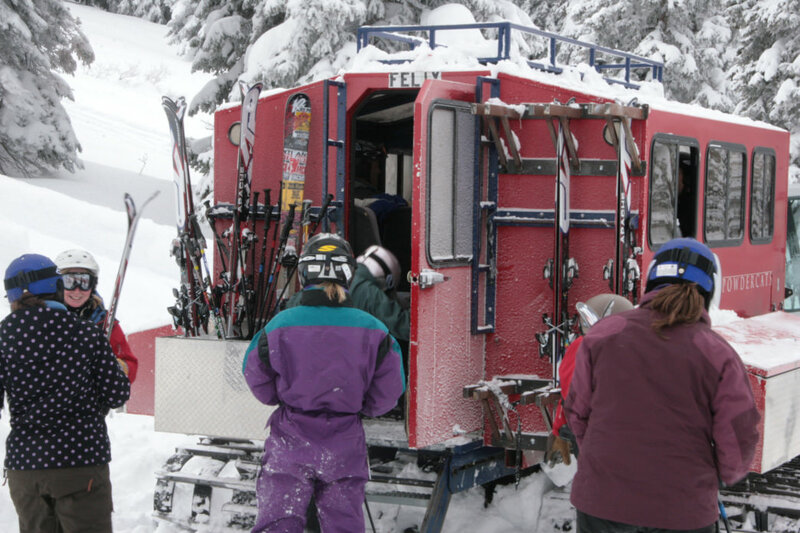 Take a snowcat (a grooming machine that also has a cabin) up, hop out when you get to the top, and bounce down fresh tracks until your tongue is lapping at your chin. Then do it again. It’s a hoot. But it’s also serious business—backcountry skiing is backcountry skiing. Full stop. You have to listen to your guides, carry avalanche gear, and be ready for variable conditions. Most cats hold 12 people plus a couple of guides (usually a lead and a sweep). In some cases, operators can split the group into different skill levels, but usually you will have to ski with whoever signs up for the day. If you want to guarantee you’ll be with people of the same ability, book the whole cat. Or go with an operator that has multiple cats and can drop groups in different spots. Do I have to worry about avalanches? Any time you’re in the backcountry in Colorado in the winter you have to be aware of the potential for avalanches. Cat skiing operators typically provide avalanche gear (beacon, shovel, and probe), provide a safety briefing, and make terrain choices for you. You still have to be on alert, but you can kick back to some degree. We’ll be straight with you—cat skiing ain’t cheap, but it’s worth every penny. Expect to dole out a minimum of $275 (at Monarch in low season) and up to $650 for the ultra-exclusive Eleven in Crested Butte (yes, that’s for one day.) If you can round up a group of friends and book every seat, you can usually get 12 spots for the price of 10. The catch is you have to slap the whole shebang on one credit card, so pick your partners wisely. How good of a skier/rider do I have to be? Cat skiing is not a good place for learning to turn, but you don’t have to be able to huck cliffs either. You should be comfortable on groomed black diamond runs. It’s even better if you’ve spent some time making powder turns. 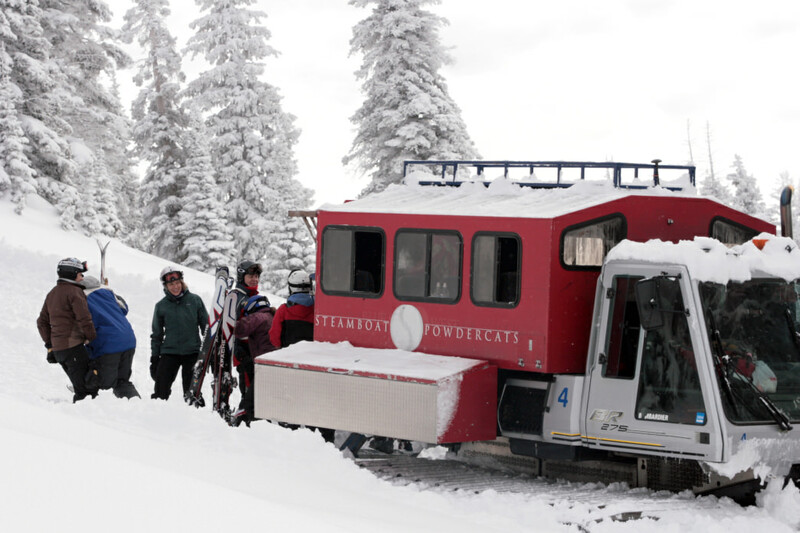 If you’re feeling a tad tentative, go with an operator like Steamboat Powdercats, which offers a Level I tour that goes at a slower pace and offers tips along the way. Also remember that even though you have the comfort of a guide and a ride, it’s still the backcountry. Save the flips and tricks for inbounds where help is near. Dial back your skiing or riding when cat skiing. Unmarked hazards not only exist, they’re practically guaranteed. Will I have a chance to sip hot toddies? If long lunches and frequent breaks are your idea of a good day, stay inbounds. Most people who sign up for cat skiing are looking to maximize their vertical. Start doing plyometrics now and plan on skiing 8–12 runs. You’ll be at it all day. Bring powder skis. When you’re charging through deep pow, you want your boards to float. Most cat operations either include powder skis or have them for rent. Ask ahead of time and procure fatties if need be. Usually a cat tour includes lunch, often in some sort of cabin or yurt, but sometimes you have to eat on the fly. In any case be prepared to be outside all day. Slap on sunscreen, load up on water, and bring a pack that will carry all of your extra layers plus avalanche gear. And one final tip: bring money for a tip. Fifteen to 20 percent is fair if you’ve had a smile on your face all day. Choosing a spot depends on how much time (and coin) you have and whether you’re ready to charge hard or would prefer a little coddling. 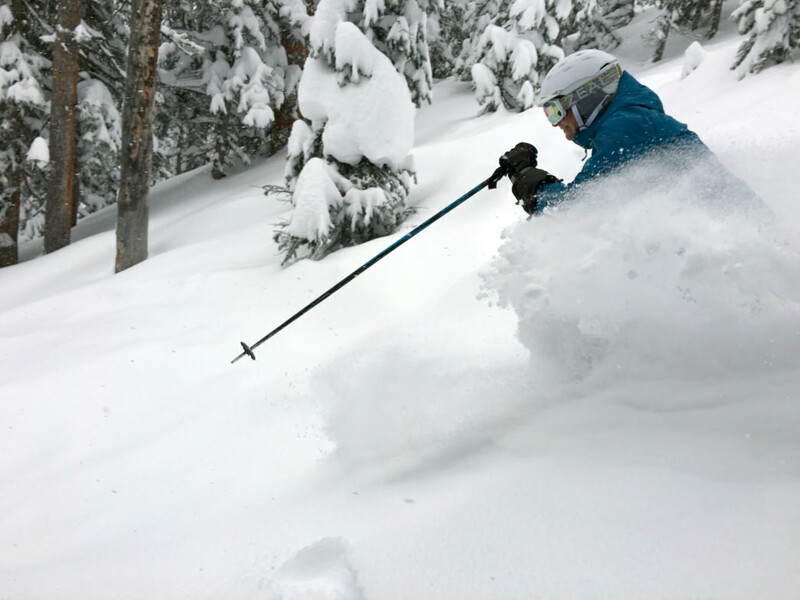 Closest to Denver: Powder Addiction covers 2,600 acres on Jones Pass, 15 miles from I-70 off Berthoud Pass. You can be at their base 45 minutes after leaving your house in Denver. Check in at the yurt in the morning and then prepare to be out all day (yes, you will make have to make yellow snow). These are big mountains. Some runs start on the Continental Divide and let you rip turns for 3,000 vertical feet. Lunch is included, but you’ll eat it in the cat or outside. This is no place to go if you’re gonna say, "Gimme shelter." Most options: Steamboat Powdercats, which operates on Buffalo Pass 20 minutes outside of Steamboat Springs, has it dialed. With three cats, they can take everyone from rookies to renegades in one day. This means you don’t have to worry whether you’ll be the turtle or the hare. Anything goes here, and if you’ve never ventured into the backcountry, sign up for the Level I tour—a gentle introduction that will build your confidence. Other options include an alpenglow trip and a full moon powder ski and dinner tour. Most affordable: Monarch Mountain, near the top of Monarch Pass outside of Salida, offers 1,000 acres of pristine backcountry cat skiing that you can see from the lift-served area. Warning: you might drool. This is the least expensive cat skiing on this list, ranging from $275 early and late season and $375 at the peak. New this year is a yurt where riders can cozy up at lunch and at the end of the day. Most chill: Ski Cooper, near the top of Tennessee Pass near Leadville, is the best-kept cat skiing secret in Colorado. Tours start on Chicago Ridge and pick from 2,600 acres (about the area of Vail’s back bowls), topping out at 12,600 feet. Don’t feel like driving home after a big day? Consider booking a backcountry yurt for a stay. Most exclusive: The Eleven in Crested Butte is so posh its 10-person cat has a name: Tucker. Load up in Crested Butte and relax in leather seats for the 45-minute ride above Irwin to Scarp Ridge, which gets hammered with three times as much snow as Crested Butte. This is thanks to neighboring peaks that create orographic lift—but don’t worry about the technicalities. Seats are reserved for people staying at the über-luxe Scarp Ridge Lodge. "Day guest" spots are released a month in advance if all the seats aren’t sold. Guides can split the group to accommodate schussers and shredders. Lunch is in a heated cabin with wifi and an indoor loo. Most terrain: Purgatory Snowcat Adventures (formerly San Juan Untracked) is now part of Purgatory Resort, and with it comes access to 35,000 acres of pristine terrain in the San Juan Mountains outside of Durango. Steep trees, big bowls, cliffs, chutes, and gullies are all game. You’ll head high on clear days, and in low visibility, you’ll keep to the trees. There’s almost always fresh powder for the taking in this huge swath of backcountry. Least intimidating: Aspen Powder Tours start with a gondola ride and drops off the backside of Aspen Mountain. The terrain includes 1,100 acres of open bowls, meadows, and glades that won’t scare off less advanced skiers. Lunch is served in a backcountry yurt that has heat but no plumbing, thought the outhouse is nearby. Seats fill quickly so book well in advance and trust it will snow. 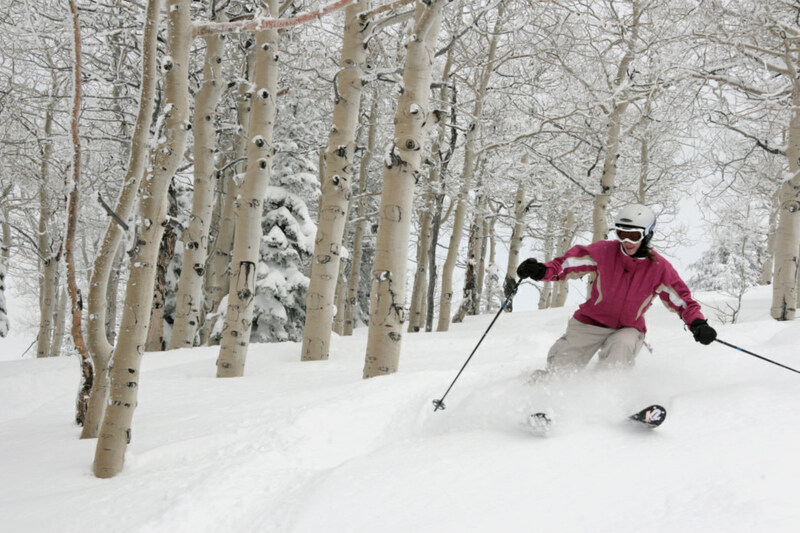 Guides typically know how to sniff out fresh tracks even days after a storm. Also bear in mind that cancellation penalties are stiff, so be sure of your plans before you commit.